Chandi runs http://paradiseofexiles.com She's a historian, foodie, writer, and passionate world traveler. "Not Norcia!" I cried out as I saw the news of the October 30th earthquake on an Italian friend's Facebook page. As I watched footage of the damage in the town I've enjoyed so much I began to cry. "Oh, not the church!" My tears doubled as I realized that the historic basilica of Saint Benedict had collapsed. Even before I read the words, I knew, this was the single most significant loss of Italy's artistic heritage in an earthquake since the ceiling of Basilica of St Francis in Assisi came down in 1997. Saint Benedict, who founded the Benedictine monastic system, was born in Norcia in 480 along with his twin sister, Saint Scholastica. His church had, until a few days ago, stood the test of time since the Middle Ages. I first went to Norcia in 2004 when I was living in Florence and then again this spring after a twelve-year absence. 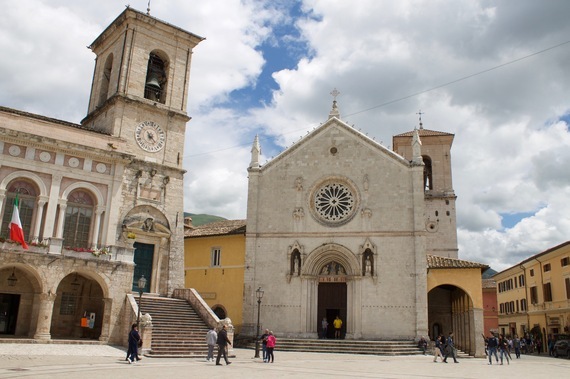 Nestled below the Sibylline Mountains in the far eastern part of Umbria, Norcia is a little town that packs a big gastronomic punch, and for me, as a foodie, and a historian, it is a very worthy destination. 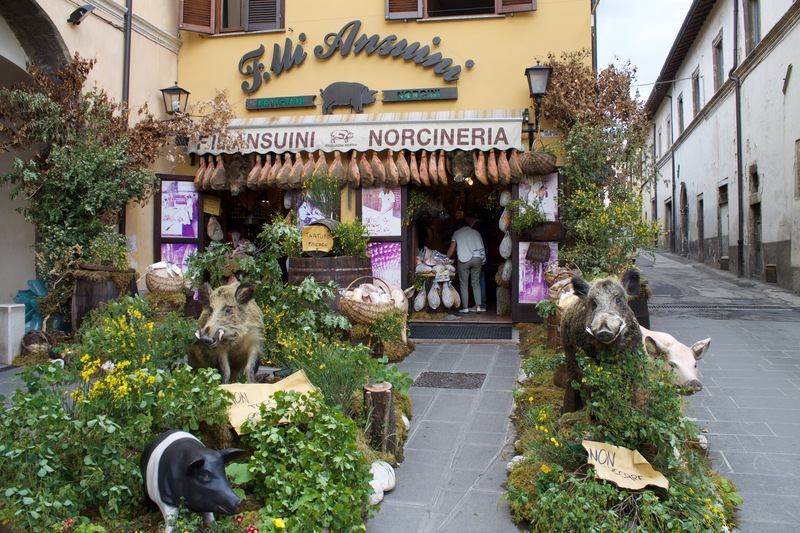 Norcia is home to the best butchers in Italy, particularly for pork products. 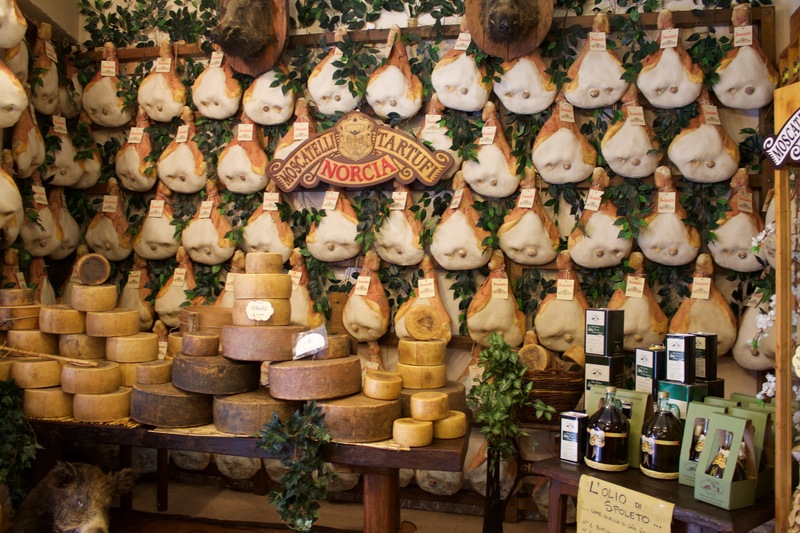 As a result, shops throughout the country that focus on pork products are often called Norcineria. The area is also known for mushrooms, black truffles, farro, and the smallest lentils in the world that are cultivated in Castelluccio, above Norcia in the mountains. Additionally, the American monks who joined the order in Norcia started a brewery, which was, in their words, "conceived to share the joy arising from the labor of our own hands." From this endeavor comes Birra Nursia's two beers, a blond ale and a Belgian strong ale. On my first trip there, in 2004, I stayed at the Grotta Azzurra Hotel, where the young man a the front desk, Federico, proudly told me that his family had run the hotel for four generations. I recall him saying how peaceful the town was. "We can get everywhere by foot, and we don't even have to lock our cars or our bikes." Then he offered to take me to the shop of the oldest butcher family in Norcia. 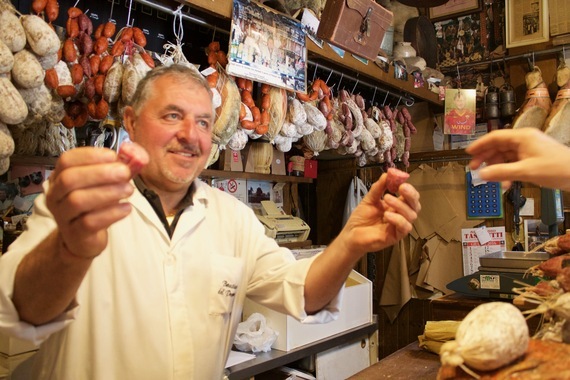 In the Norcineria Ansuini shop, I met Signore Ansuini who sliced prosciutto for me try. Like in so many shops in Norcia, the shelves groaned with cheese wheels, salumi and jars of black truffles. 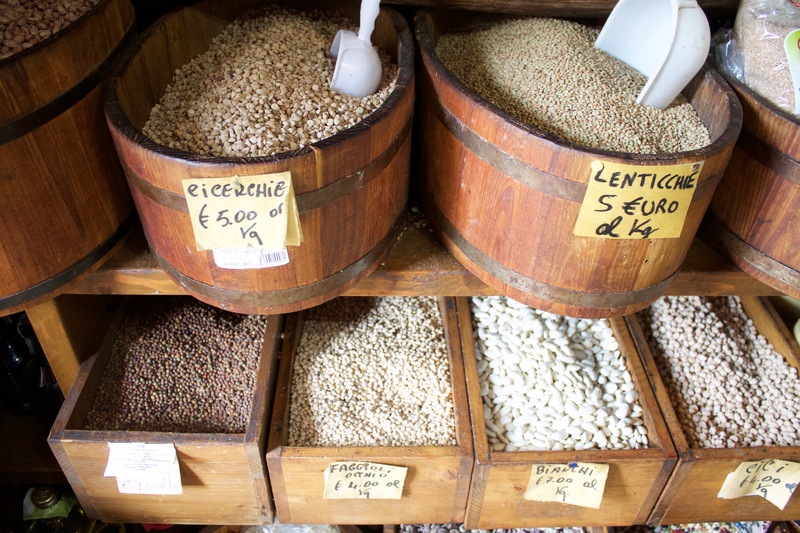 On the floor, wooden barrels were full of tiny lentils, farro, and white beans. Above our heads hung sausages called Corallina and Lonza. Signore Ansuini offered to take me up the street to his cellar. 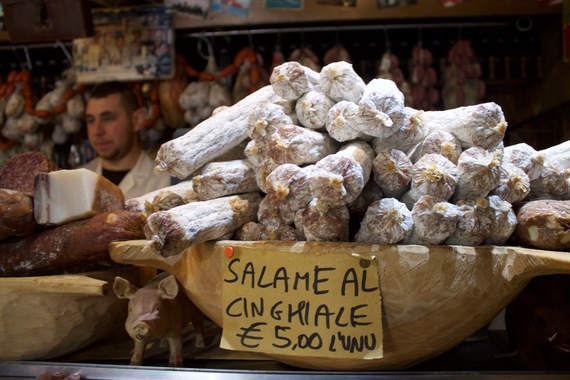 Through a door in the wall, we dropped into a cavernous room below the street where from rough-hewn branches, his precious lonza sausages hung. He pointed to a Lonza sausage that had been aged for a year and said, "No one ages these for a year anymore. I do it because I want to have the very best." "Simple ingredients," he said as he explained how they're made. 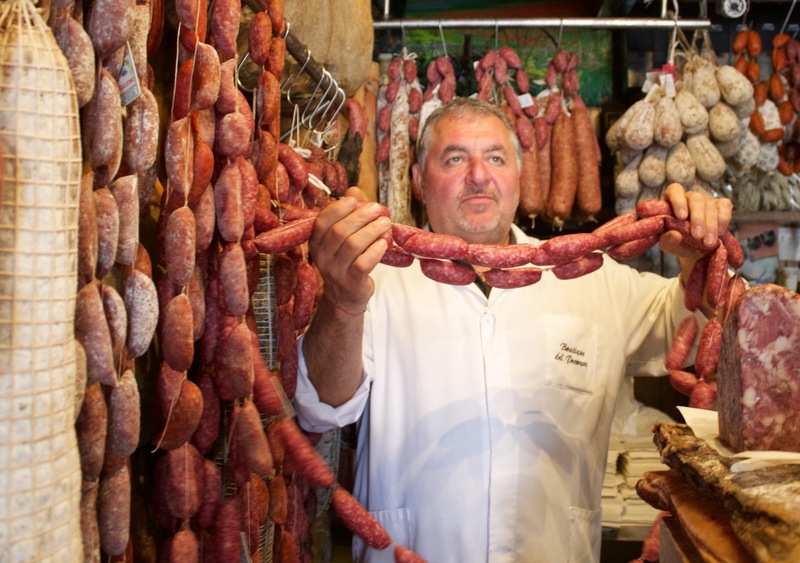 "Just a bit of fennel, salt and pepper and of course the highest quality meat." Walking back towards the hotel, Federico stopped in the main piazza and pointed out to me, on the façade of the church, the statues of Saint Benedict and his twin sister, Saint Scholastica. The church, he told me, was constructed on top of the ruins of the house where the two saints were born. He took me in to show me the remnants of their home, telling me that Saint Benedict was named Patron of Europe in 1964 by the Pope. After noting that Saint Scholastica's brother had a statue in the middle of the piazza as well as the main basilica, I asked Federico, "Anything that honors his sister?" 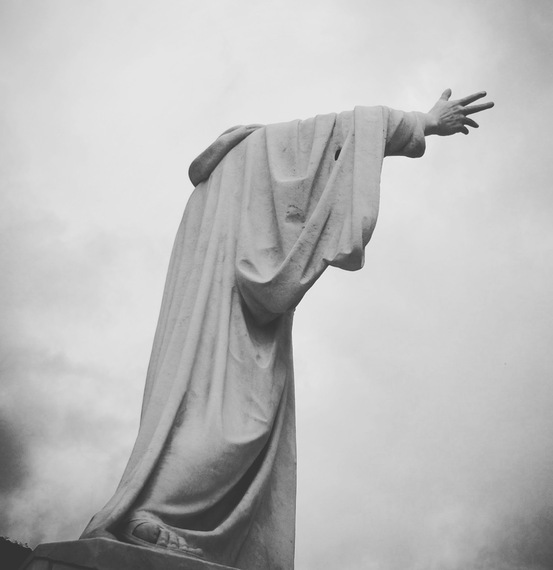 "There is a church dedicated to her in the cemetery outside the city walls," he replied. 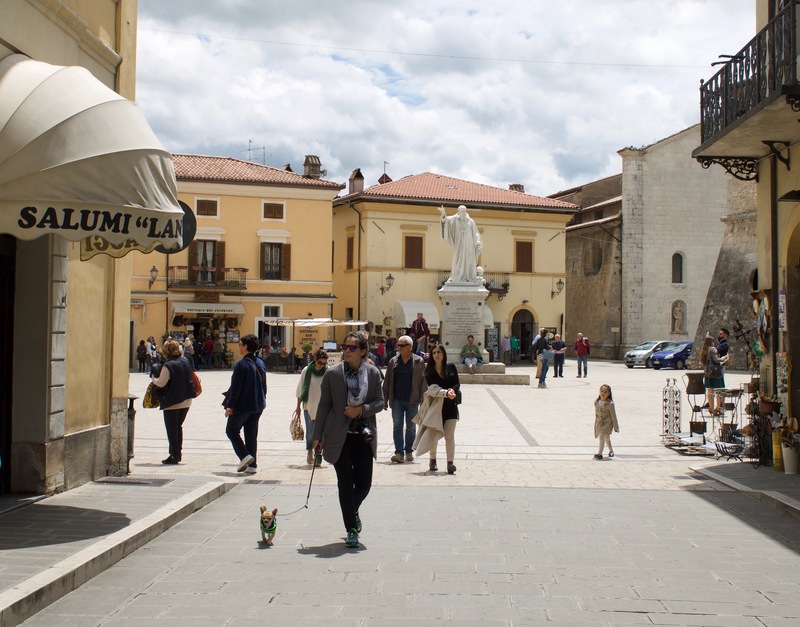 This spring, I was excited to go back to Norcia, having fond memories of it from twelve years prior. My friend John and I stopped in on the town for a few hours after two days in the Monti Sibillini. 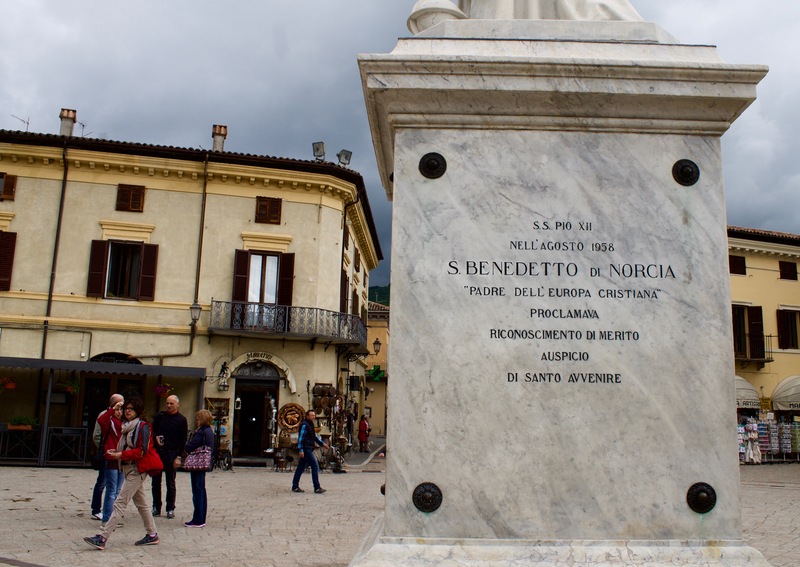 We went into Saint Benedict's Basilica--something that no one misses on a visit to this little town, and sadly I took no interior pictures, never imagining that five months later it would be gone. We were entertained in each shop, taking in the beautiful displays and trying the products happily shared with us by grinning shop owners. Then we chose one of the many inviting trattorias for a last lunch before John headed south to Rome, and I, north to Tuscany. 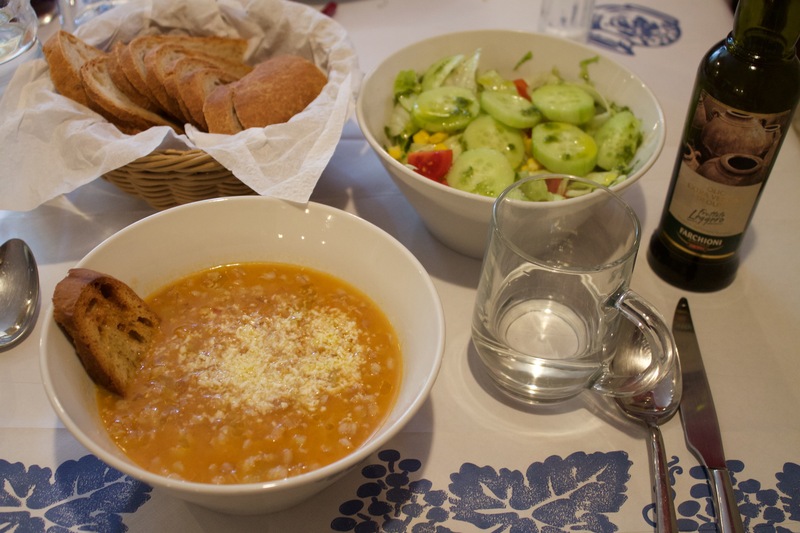 John had homemade rigatoncini with a white sauce of pecorino and ricotta and salami and I opted for a Farro soup. Through an opening in the large walls, we exited the town, carrying sticks of cinghiale sausage and jars of truffles. My affection for Norcia had been reignited, making my tears all the more bitter on October 30th. Norcia was known in ancient times as Nursia. Because of the skills of the town's doctors and surgeons, nursino came to mean "one who cares for other people"-- clearly where our word nurse comes from. And now we need to care for Norcia by donating to earthquake relief to help rectify the basilica and reinvigorate the food artisans and their traditions. Many of the Benedictine monks of Norcia have temporarily moved to Rome, while two remain in Norcia to keep watch over the basilica. They announced, "We strive to maintain the order of the Rule even during the most difficult of circumstances, and this transfer, while disruptive, will ensure the safety of our monks and grant us all the peace to continue to practice our monastic life. Please continue to pray for our community, and consider giving a gift to help our effort to rebuild."